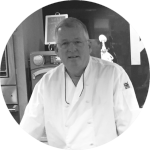 Alan Pyles has been Owner/Chef at the Lafayette Inn & Restaurant located in Stanardsville, Virginia, for the past 11 years. Before he and his wife and partner, Kaye, purchased the Inn, Alan spent over 3,000 nights in hotels across America during a prior career. This experience laid the foundation for the food, wine and overnight experience that the Lafayette strives to deliver for guests.